Come back to a home that looks and feels great! Without spending a minute of your precious time. Home Maid Clean has an exceptional team of domestic cleaning maids that keep your home sparkling. Subscribe for our London domestic cleaning packages – on a daily, weekly and fortnightly basis. Who will clean your home? All regular cleaners have their passports, work permits, proof of address, previous address history, and previous employer’s references checked. Approved maids undergo specific training that includes a practical test, before being assigned under a supervisor that further trains them. 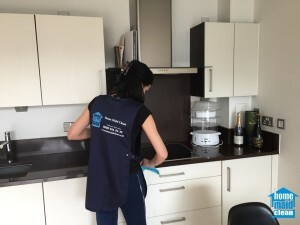 A cleaning maid is only assigned to new clients after careful monitoring and assessment of the quality of services that is delivered over the period of the training. No minimum contract – only pay when you use our services. If on a holiday or business trip and subscribed for regular cleaning – let us know 24 hours before the cleaning, so our maid would not come. Customer choice of cleaning time. Many clients prefer to give us a key so we can clean when they are away. All keys in our possession are given a code designation and are secured when not in use. How to spot our cleaning maids? We have decided to have a maid from Home Maid Clean on recommendation of a friend. We are very happy with Maria. She comes at our place twice a week to do cleaning and ironing and she exceeds our expectations each time. My place needed a really good cleaning. It was such a mess! What impressed me most about Home Maid Clean was that they totally exceeded my expectations! I highly recommend them to anyone looking for a professional and exceptional cleaning experience.